Lavas Tacotal is located 10 kms west of the Catholic Church of La Fortuna, with the Arenal Volcano as a background and surrounded by an amazing natural setting. 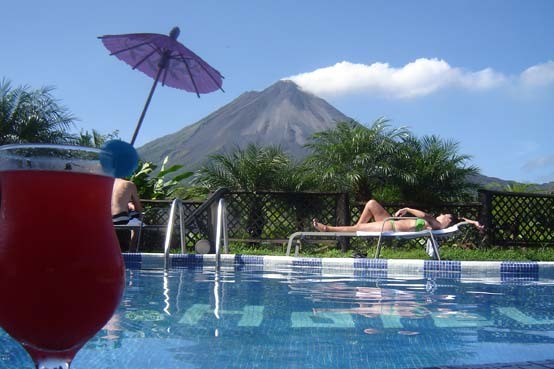 Lavas Tacotal is a casual luxury hotel that offers 42 of the best luxury rooms in the Arenal Volcano area. All of the rooms have panoramic views of the volcano and have Italian tiled floors with concrete and wooden walls, and handcrafted ceilings. The rooms are equiped with ceiling fans, lamps, private baths with hot water and air conditioning. The room’s furniture include two double beds, two night tables, four confortable chairs, and a small porch with a perfect view of the volcano.